We like the Municipal Art Society’s idea of doubling the size of the amusement area and removing hotels from the south side of Surf Avenue. This way, when visitors get off the subway, they will meet sunlight and open air, not a high-rise barricade. That one paragraph ought to be sufficient to communicate that the city’s overall plan is itself none too brilliant. The extracted paragraph above describes the core components people say are needed to “fix” the city’s Coney Island plan. There are other aspects of this “fix” not mentioned in the Times paragraph, like protecting Coney Island's historic buildings. When you come right down to it, the aspects constituting the necessary fix would be the best part of the city plan if it ever passes, may be even the only good part. Most of the Times editorial is marred by far too much credulity respecting the benefits the city plan might actually have. That plan could also be destructive. We believe it is more likely to leave a hole in the ground if, as we must skeptically suggest, the city plan is destined to succeed in far fewer ways than touted. This is the year the place [Coney] could get moving again, if the City Council approves an ambitious redevelopment proposal from the Bloomberg administration. It calls for revitalized year-round amusements, badly needed apartments and new retail and commercial development. Coney Island is not just a decrepit carnival — it’s a community starving for civic amenities, affordable housing and jobs, all of which could flourish amid the tacky splendor of a reborn seaside paradise. First off, when the Times says “This is the year” that Coney “could get moving again” it seems oblivious to the fact that Coney’s resurgence, at least as envisioned by the city, is likely to take generations, which is what real estate processionals are saying. 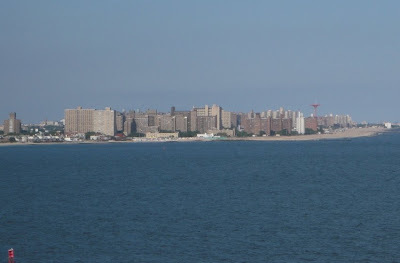 (See: Thursday, May 28, 2009, A Second, But Not Seconding, Opinion: A Stolerian Eyebrow Raised, Real Estate Professionals Say Coney Island Development Will Take “Generations”.) As for starting on that plan now or starting soon, we are in a recession where financing for these kinds of mega-ventures is likely to be especially hard to come by and a where one of the major and currently improbable aspects of the city plan, hotels, will be impossible to finance. Is Affordable Housing Badly Needed in Coney Island? At the City Council hearing Mr. Pinsky bemoaned that the average commute of Coney residents was exceptionally long: 45 minutes. We suspect that more housing is likely the only thing (if anything) that the city is really thinking will be built at Coney in the relatively near term. But if the city adopts a plan that makes it a priority to build more housing at Coney, doesn’t that simply bloat the number of New Yorkers with these troubling long commutes? Can the Housing in the City Plan Actually Be Built? Noticing New York is in favor of building housing in Coney but the affordable housing we have suggested building there is what we have referred to as next-step-up affordable home ownership program housing (including the program’s accompanying rental units) which would be attractive to residents of Coney’s other subsidized housing who were doing well enough to move out (and up), thus freeing up the units they vacate for others. That next-step-up housing could be done as infill and would not necessitate the sacrifice of amusement and seaside acres. That sounds like several wins at the same time to us. The Times values the city plan because it describes the community as “starving for . . . . jobs.” But the city plan fails to take advantage of the amusement industry as the traditional sources of jobs in the community. Rather than capitalize on what the amusement industry could offer, the city prefers to besiege the entertainment community, maginalizing it in an ever-shrinking cloister until it is eliminated entirely through attrition. The few remaining landmarked rides that may remain will serve as little more than gravestones. [Coney’s]. . not dead yet, of course: landmarked rides like the Cyclone rumble on, and a few funkily indestructible carny attractions survive, along with the boardwalk, the hot dogs and the sea and sky. The city undervalues the strengths of Coney on which it can build and the Times does not seem to have picked up on this. We are in favor of extending the season at Coney and there can be some year-round attractions. That is one reason the Shore Theater should be preserved, a step the city has been unwilling to take. We say start with preservation of things of recognized value; don’t focus on destruction first. There is more that we disagree with in the Times editorial. It says, “There’s a nice ballpark.” Not really. The ballpark is awkwardly placed. It is in the middle of what was supposed be amusement acreage, making it difficult to use the land on either side. Its long, monotonous blank walls are surrounded by seaside land that has been unnecessarily tuned into a bleak parking lot that should have been put somewhere else. And did the ballpark lead to the Thunderbolt roller coaster being torn down? The ballpark exemplifies just another of the city’s continuos efforts to keep subtracting from the amusement area. Much depends on Domenic Recchia Jr., Coney Island’s councilman, who has been skeptical of the city’s plan while stoutly defending the interests of landowners, like his friend Mr. Sitt. Mr Sitt could very quickly be out of the picture. All it would take is for the city and Sitt to agree on a price for the city to acquire Sitt’s land. That is something that is quite likely even if the city’s own actions have driven up the price of Mr. Sitt’s exit. Skepticism of the city plan will become all the more important upon Mr. Sitt’s departure. Unfortunately, that may be the time when find Mr. Recchia’s skepticism of the city plan fades away. What we are very likely to get without appropriate skepticism on the part of the City Council and the public is a city plan that is not fixed, a city plan where visitors to Coney will, in fact, be met by “a high-rise barricade” and will NOT be greeted by “sunlight and open air.” We are likely to get a Coney without a viable open-air amusement area, a Coney that turns out to be more a hole in the ground than anything else. Because, without skepticism we will have gotten a plan that was worse than no plan at all.